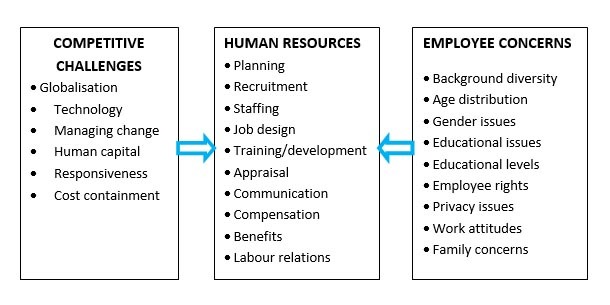 Human resource is the key area of any organization and its efficient operation can lead huge organizational success and may provide financial benefit on investment for sustainable competitive advantage (Luthans and Yousef, 2004). But in complex business environment, there are range of problems faced by managers due to globalisation, technological development and changes in political and legal atmosphere. This results in pattern change in the roles of specialized persons. Today major challenge of HRM is to attract, preserve and raise talented employees when operating at global level. Challenges of human resource in current management: Many studies documented that HR faces numerous challenges in current business atmosphere. The most serious challenge is the process of globalisation. At a political and financial level, globalisation is the practice of denationalization of markets, politics and legal systems such as the use of the global economy. Globalisation refers to expanding the business beyond national borders of the same market forces that have operated for centuries at all levels of human financial activity such as village markets, urban industries, or financial centres. It indicates that world trade and monetary markets are more incorporated. Due to rapid internationalisation of business, it impacted on human resource management in terms of problems of unknown laws, languages, practices, competitions, attitudes, management styles, and work ethics. HR managers have a challenge to deal with more diverse functions and more participation in employee's personal life. Another human resource challenge is workforce diversity. Management theorist, Thomas (1992) stated that dimensions of workplace diversity include age, ethnicity, ancestry, gender, physical abilities/qualities, race, sexual orientation, educational background, geographic location, income, marital status, military experience, religious beliefs, parental status, and work experience. The triumph of any organizations depends on managerial quality of top and middle level team that can bring pioneering ideas, perspectives and views to their work. Many theorists stated that managing and valuing diversity is a key component of effective people management, which can improve workplace productivity (Black Enterprise, 2001). Managing diversity is more than simply acknowledging differences in people. It involves recognizing the value of differences, combating discrimination, and promoting inclusiveness. Managers may also be challenged with losses in workers and work productivity due to prejudice and discrimination and complaints and legal actions against the organization (Devoe, 1999). The challenge and difficulties faced about workplace diversity can be turned into a strategic organizational asset. With the combination of talents of diverse cultural backgrounds, genders, ages and lifestyles, an organization can fully utilize business opportunities especially in the global area. But if the organizational environment does not handle diversity successfully, there is a risk to loose talented employees and competitors may get benefitted which may result in low productivity and downturn in fiscal system. This is true for multinational companies who have operations on an international scale and recruit people of different nations, ethical and cultural backgrounds. Therefore, a HR manager needs to be watchful and may follow a Think Global, Act Local approach in most business situations. Think Globally, Act Locally" approach means that the strategy implemented by multinational companies according to which global perspective is adopted in terms of formulating company vision, long-term aims and objectives and devising effective strategy in order to achieve these aims and objectives, however, adaptations are made in each market according to the culture and specifications of any specific market. Establishing worldwide vision for a company is important due to the fact that it helps to attain the primary objective of the businesses, which is profit maximisation, in the most effective way through intensive market expansions across countries and continents. However, the strategy any multinational company adopts in order to achieve its global vision does not have to be rigid, because different markets differ from each other on the grounds of political system, religion of people, culture, standard of life etc. and these differences find their reflection on consumer behaviour, customer expectation and other related matters. Though, there are range of challenges that must be addressed affectively. Generally, the difficulties associated with the need for companies to adapt to local differences can be categorised into three groups: cultural misunderstanding, incompetent management, and changing needs. Cultural misinterpretation is one of the reasons for companies who fail to be successful in foreign markets and huge mistakes occur when managers misunderstand and transmit wrong information, make mistakes in doing business due to cultural misunderstandings" (Grosse, 2000,). The management may understand the need to adapt to local differences in order to succeed. However, unless the culture of an overseas market is learned and understood thoroughly, any adaptation attempts may prove to be counter-productive, especially when a culture between home country of the company and the culture of the host country are different on the fundamental level. In India, there is huge population and the nations struggle towards high technology and knowledge-based economy; overseas talents are attracted to share their expertise in many areas. Consequently, many local HR managers have to go through cultural-based Human Resource Management training to further their abilities to encourage a group of expert that are highly competent but ethnically diverse. Additionally, the HR professional must guarantee the local professionals that these overseas talents are not a danger to their career progression. In many ways, the efficiency of workplace diversity management is dependent on the skilful balancing act of the HR manager. Technological advancement is also a great challenge for HR managers. Because, HR managers have to cope with the rapid technological changes which influence the nature of work and generate obsolescence. Advanced technology may decrease job opportunities among youths that require little skill and to augment the number of jobs that require technical skill. This a major shift which is referred as changing from touch labour to knowledge works. In quickly changing technology in various fields, companies have to transform their business operations and adapt with new working technology. Such advanced technology creates joblessness and in other hand, there comes shortage of skilled manpower. Therefore it becomes trouble for HR to manage their workforce. Changes in political and legal environment can create trouble for HR managers in organization. Transformation in political and legal environment indicate changes in political parties and rules regulation which results in implementation of new laws and company have to follow all laws while operating business globally. Many changes occur in the legal and political framework within which the industrial relation system in the country is now functioning. It is the responsibility of human resource and industrial relations officers to completely scrutinize the implication of these changes and bring about essential adjustment within the organization so that later utilization of human resource can be achieved. It is the responsibility of Human Resource manager to foresee the changes and prepare organization to face them without any collapse in its normal working. Other human resource challenge in business environment is changes in the financial environment. This includes assessment of the impact of a number of factors on production. Major factors are the shortage of raw materials and other inputs including power and electricity, support of the culture of consumerism, increasing consumer awareness and demand for quality products, continuing upward trend in the inflationary pressures with decrease in the purchasing power of rupee and its spiralling effects in the ever increasing ambition of workforce for higher salary and other material benefits and increasing costs on the employee welfare and other benefits. In an inflationary economy, the resources tend to become limited and the costs of machine, materials and labour multiply. This increases the capital and operating costs. In the period of uprising in Information Technology, HR managers have difficulty to adjust in business environment and manage their team. 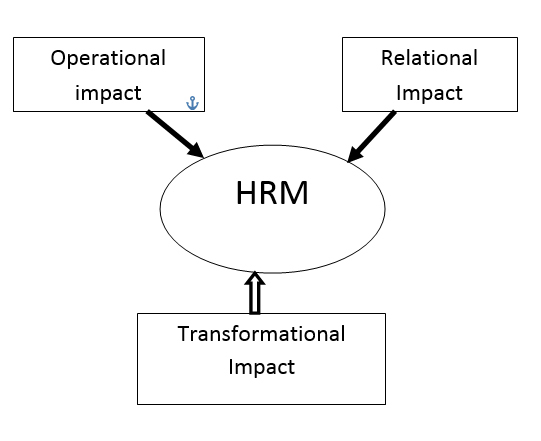 Information technology has influenced HRM through human resources information systems (HRIS) that modernize the processing of data and enable to employee information more readily available to managers. 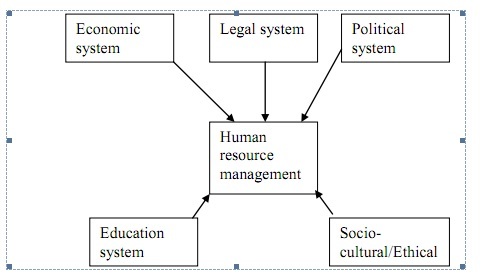 It includes two main areas in application of computer in the managerial decision making process. First is the use of electronic computers managerial decision making process and secondly computerized information system will have great impact at the coordinate and strategic levels of organization in future. Ways to overcome HR challenges: Human resource challenges due to globalisation and advancement of technology can be lessened through effective management in organization. These HR challenges can be reduced through cross cultural training of HR personnel so that they recognize other cultural people. Organizational team must motivate Professional personnel so that they do not change organization more frequently. It is said that financial motivation is not always required instead it is necessary to encourage through non-financial motivation like training of employee, job satisfaction. HR should adopt the change at internet speed. Another way to overcome human resource challenge is to change HR strategy with altering economy. Strategy of HR should be supple, capable of flexing and adaptive to changes in the economy. Technical changes in the place of work often need the execution of additional training for workers. As training and development is generally the area of the HR department, this creates another challenge for human resource managers. HR must first decide what training is necessary and then implement training measures to make sure all workers can keep up with technical changes. Human resource managers must also determine when it may train existing employees, and when they have to recruit new workers to fill technical positions within the organization. There are many techniques to overcome workforce diversity. Efficient managers are aware that certain skills are necessary for creating a successful, diverse workforce. Managers must understand discrimination and its consequences. Managers must distinguish their own cultural biases and prejudices (Koonce, 2001). Diversity is not about differences among groups, but rather about differences among individuals. Each individual is unique and does not represent or speak for a particular group. Finally, managers must be willing to change the organization if necessary (Koonce, 2001). Organizations need to learn how to manage diversity in the workplace to be successful in the future (Flagg, 2002). Roosevelt (2001) stated that managing diversity is a wide-ranging process for creating a work environment that includes everyone. When creating a successful diverse workforce, an efficient manager should focus on personal awareness. Both managers and associates need to be aware of their personal biases. Therefore, organizations need to develop, implement, and maintain ongoing training because a one-day session of training will not change people's behaviour (Koonce, 2001). Managers must also understand that fairness is not necessarily equality. Another essential requirement when dealing with diversity is to promote secure place for associates to communicate (Koonce, 2001). Social engagements and business meetings where every member must pay attention and have the chance to speak, are good ways to create discussion. Managers should implement policies such as mentoring programs to provide associates access to information and opportunities. Human resource information training must be conducted to the HR managers or HR professionals so that they can beat Information Technology challenges. Proper performance evaluation system and proper career development plans should be used in the organization to decrease professional mobility. To conclude, HR practices in multinational companies are more challenging in present business circumstances. HR managers of any company have to undergo lot of problems like retention, attraction of employee, dealing with different cultural people, managing work force diversity, technological and informational changes. To deal with these challenges, it is recommended to conduct Cross cultural training and technological and informational training program. To reduce mobility of talented employees, HR managers have to encourage them from financial and non-monetary techniques. There is a need to improve HRM Function and devise its policies, procedures and processes to work on the global level. Currently, most of the HRM Policies are focused on the real country, but the employees have to start to move from their nation to other parts of world and the HRM Processes must support such a need in the organization.